We woke up at 3:00am and drove 3 hours to get there. I knew it was up in the mountains so I took a motion sickness pill before we left. During the drive I tried to stay awake as long as possible, but around the halfway mark, I just couldn’t keep my eyes open any longer and I slept for the rest of the drive. I felt terribly guilty, but Dave was such a good sport about driving while I snoozed. In our experience in Korea, the earlier you get somewhere, the less people will be there. This is not the case at Jusanji. When we pulled up around 6:30am, were shocked to find the overflow parking lot to be almost completely full. We parked, bundled up and then followed the crowds to the reservoir. The walk took about 10-15 minutes. It is relatively flat for being up in the mountains, but there is a slight incline for most of the walk. Once we got to the reservoir, we squeezed in among the masses for that perfect spot to take photos. Dave and I both took turns taking photos. It was so peaceful with the fog lingering and the sun tucked just behind the mountains surrounding us. Even though waking up early on a Saturday was tough, it was completely worth it to witness the beauty of Jusanji. You have to click through the photos below… this place is just too beautiful to not look at it. After the sunrise, it started getting colder and the fog started getting thicker so we decided to head back to the car. 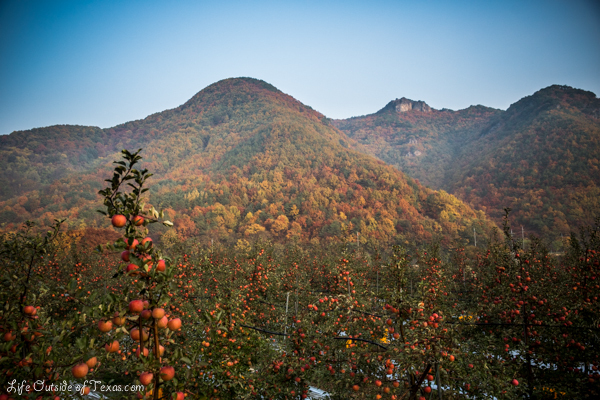 The entire area surrounding Jusanji is full of apple orchards. 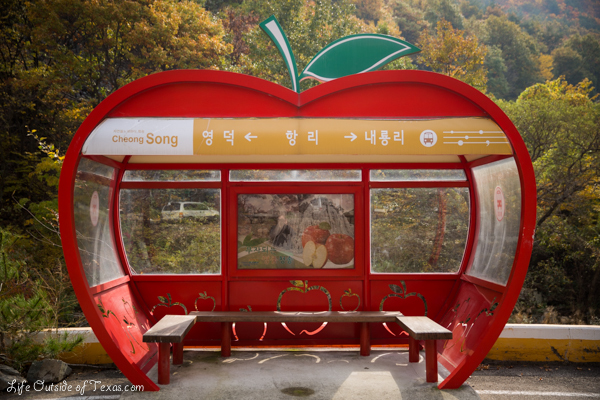 Even the bus stops were shaped like apples! After Jusanji, we went to Juwangsan National Park (15 minutes by car) and walked around. 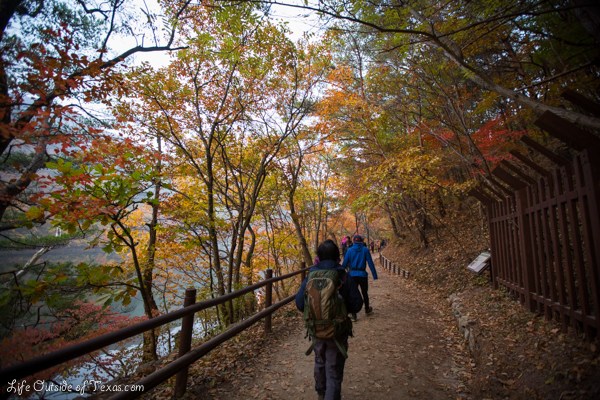 We didn’t do any hiking, but Juwangsan is famous for its beautiful hiking trails. 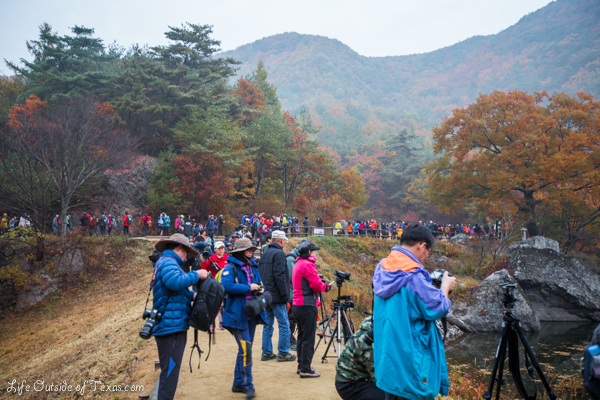 If you want to hike, the admission is 2,800 won for adults and 600-1,000 won for children. Parking at Juwangsan was 5,000 won. 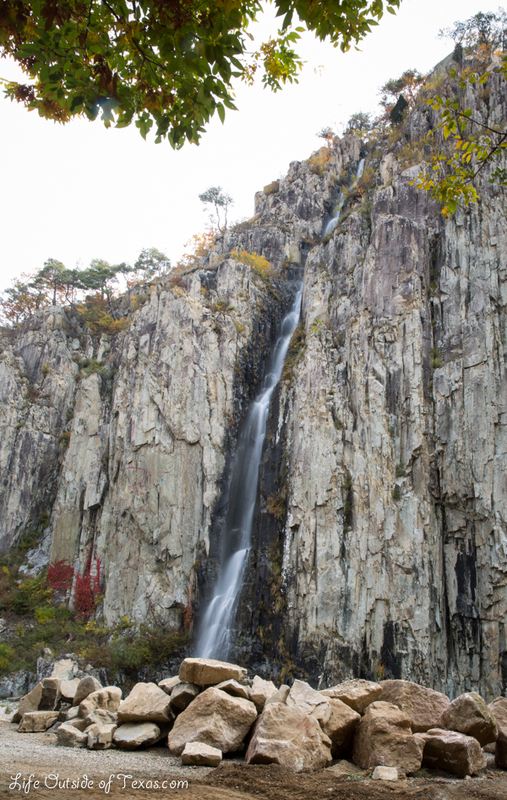 We decided to drive through Pohang to get home and we passed by a waterfall. It was the perfect ending to a really amazing day. This entry was posted in Autumn, Gyeongsangbuk-do and tagged autumn in korea, expat blog Korea, expat in Korea, expat in Ulsan, fall colors korea, fall in Korea, 주산지, 주왕산, jusanji, juwangsan, korea road trip, photography, places to see in Korea, travel, travel in Korea by Meagan & Dave | HappilyEverExpat.com. Bookmark the permalink. WOW! This place is breathtaking. I really love your photos… you managed to get some beautiful shots without so many people in them haha. When we went to Bukhansan National Park a couple of weeks ago, we thought it was crowded there, but GOOD GRIEF, this place looks packed! That’s the only downside of Korea for me… the amount of people who crowd to these beautiful places leaving no hope of finding solitude. The nice thing about Jusanji is that you can really only stand on two sides of the reservoir so it helps when you’re trying to capture the beauty of a place, or just trying to enjoy it. I think fall colors and cherry blossom season are the two big times of year when everywhere pretty will be extremely packed. We have found that the earlier you go places, the less crowded they will be. That worked out really well for us when we went to Boseong Green Tea Plantation and Damyang Bamboo Forest. If you get there right around opening time, everything is so peaceful! You gotta beat the tour buses! The tour buses were definitely out in full force in Jusanji and Juwangsan. You especially want to beat the tour buses to the bathroom lines! Thanks! I appreciate that. It was a truly amazing place. So gorgeous! I might have to go there this weekend. Although, I am without a car so it might be trickier with public transport ha. Thanks for the amazing pictures! I hope you’re able to make it. It’s amazing a sunrise. Wish I could help with how to get there by public transport, but I don’t actually know. These are stunning pictures, Meagan! Well done Dave on the 330am driving, though! Thanks, Val. I don’t know how he did it. He’s a good one, that one. Your photography of a such a beautiful place is excellent!! And I loved your photos of people taking pictures … I took a similar image when in the Smokies last month. Thank you so much! It always gives me pride when other photographers pay me such nice compliments. Autumn in Korea is stunning. I’ve lived in Busan and Ulsan and since I was always stuck in the big cities, I never really got a chance to see the fall colors until this year. So amazing! 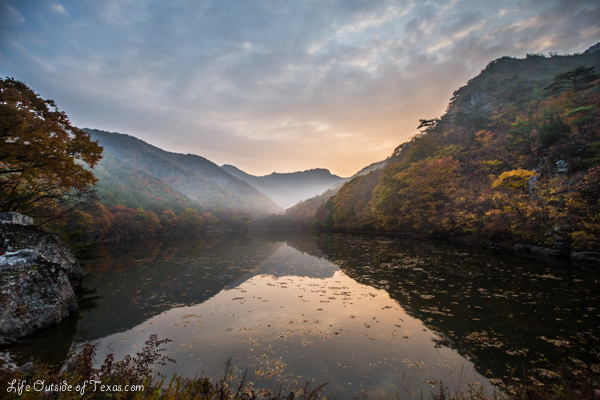 What’s your favorite place in Korea that you’ve visited/seen for fall colors? I think I’ve been to Jusanji before, although I can’t remember 😦 if its the pace I’m think it is though, we were there in early summer and the reservoir was quite empty so the magical mystical effect you have in your pictures was missing. Incidentally, so were the crowds. Yes, that must be it! I think I read somewhere that they use the water in the summer and it gets quite low. The best time to see it is spring and autumn. I should probably update the article or someone else might be just as disappointed as you were. I’ve been to a few reservoirs, such as the big one near Chuncheon, and they usually wait to fill them up with the rain in July and August (a bit like a tap and a bath y’know) as it’s so dry here over the winter. Wow, those are some stunning pictures! I would love to go back and spend more time there, we went a little late in the day and had to leave pretty quickly after arriving. It’s a bummer that you guys got there late (and that your headlight wasn’t working properly!). I’m curious about the coastal road you mentioned. What’s the name of the road again? We tried to go back that way from Jusanji, but we were just on a main highway. I don’t think it was the right one… the one that everyone raves about. Amazing images, and soooooo can’t wait to return next month. Let’s hook up. Cheers. Thanks! Where in Korea will you be and for how long? I’m actually about to head home for the holidays so I’m not sure if I’ll be around.